Ever heard about the Moka Pot? Probably you have, or maybe you don’t recognize the name but have seen pictures countless times. This is classic, homemade, traditional, and cheap for of espresso. The Moka Pot is a mix between what it used to be and what should be, mixing the best of both worlds. And of course, this doesn’t mean a pot can get the same pressure and quality an expensive specialized machine can, but it can still get close to that result, for a fraction of the price. Like a French Press coffee maker, it also works without electricity and can be taken anywhere outdoors. How does it work though? It is rather simple, and the simplicity of the process is what makes this a unique method of making espresso. For sure machines are simple to use nowadays, but this feels just traditional and easy. Applying the steam pressure to go through the coffee grounds, this makes that pressurized shot of coffee we know as espresso. While adding water to the bottom section of the pot, and adding the ground coffee on top, and then placing it on a heat source, this apparatus produces quality espresso shots without electricity, making it unique. Remember that Moka and Mocha are two completely different things, and with the Moka Pot, no chocolate should be even mentioned, and this is just a different method of making espresso. 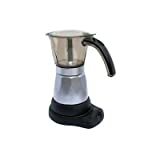 Hold on; the Moka Pot makes espresso, but not the same quality as what the machines can make, so why should you use one? Well, it’s quite simple. 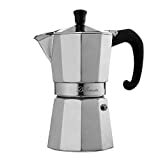 The Moka Pot doesn’t makes espresso like a machine, and therefore it’s not the same, but that doesn’t means it tastes bad, the Moka pot is capable of getting a different product, with a full body and rich aroma. This is a must for coffee lovers, and even with all the machines available, back in Italy they still use the Moka pots everywhere. The grind size for this process is quite specific, it cannot be too big or else the steam won’t be able to truly get the coffee’s best properties and infuse it correctly, but the ground cannot be too fine or else the equipment will clog and well, that’s always bad and messy. 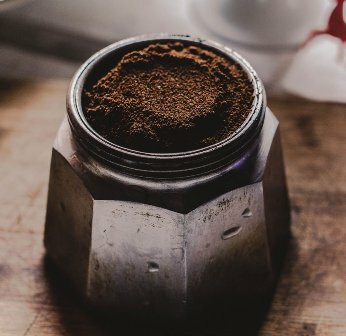 We suggest to use some good coffee grinder to achieve consistency in results. A great cup of coffee is impossible without a good grind! The Ground has to be fine, but not excessively fine, so most people recommend an espresso grind, but you can also go as far as using a coarse grind, and it will work fine, delivering a great cup of joe. So now that we know what the Moka pot can do and it can’t do, and also, what kind of grind size we need, let us continue to the process, and this is where the real fun begins. First of all, we have to prepare the brewer, and knowing how much ground coffee is needed is vital to a good brew. This changes from pot to pot and you have to check and measure how much coffee fits in the coffee basket, located on the top portion of the brewer. In general, about 15-17 grams of coffee packs in a 4-cup Bialetti Moka. As a rule of thumb, the most common coffee-water ratio is 1:7. Once you know this, fill the coffee container and prepare to fill the boiler (bottom part) with water, you should NEVER fill the release valve with water, so make sure that you never reach that point. The temperature of the water used, in my opinion, should not be hot from the start, as it makes handling most Moka pots way harder, because of the boiler heating up and the metal heating up with it. This can lead to some nasty burns, so I’m not exactly a fan of the idea. Make sure that the rim of the pot is clean (to ensure that it seals off) and screw it together, if any steam comes out of the sides, that means the seal didn’t work. Now that we have the Moka pot ready for action, it’s time for the heat to act, and it should serve as a second character in this mixture. By that I mean that the temperature should never be high, it should always be set on low even if you want to make the water boil fast, this is quintessential for the optimal brewing of the coffee and maintaining the excellent quality for the result. This is because the full body of the coffee has to be extracted slowly with this process, or else you will miss the best parts of a great cup, and you could even burn it as well. 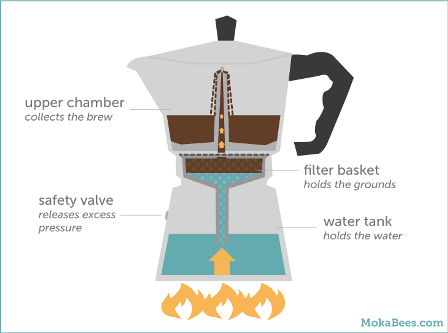 Here is a pictorial presentation of the insides of a Moka by Mokabees. When the upper portion of the pot is full of coffee, you can now remove the pot from the heat. Remember to always stir the coffee before serving. The result should be a strong coffee, similar to espresso and with a full body and embracing aroma. Here is a video, if you like to understand the brewing process via visual! Pour into your favorite cup and enjoy this fantastic taste of tradition and quality! If you want to try this but you are not the proud owner of one of these beautiful pieces of engineering, look no further. Here are the best pots along with the reasons why. The Pot Material – From the classic aluminum to the new stainless steel, it taste and what you like better. In my opinion, stainless steel tends to be easier to clean and feels better, but aluminum is classic and looks pretty good as a part of any kitchen. The Pot Capacity – This really depends on each one of us, and the needs we have. How much coffee do you need from each brew? How many people tend to drink coffee at your place? That being said, the capacity tends to be from 3-10 cups depending on different brewer variants. The Pot Handling – This means how easy it is to use each Moka Pot. And let me tell you, there are some significant differences here. There are some new electric moka pots that are incredibly easy to use. But, they are not as traditional as the basic ones, and obviously, they are not as cheap. Now let’s continue to a few products that are worth mentioning – The Best Moka Pots. Everything has options in the market and so thus the Moka Pot. We have filtered out the best ones you can trust and brew with confidence. 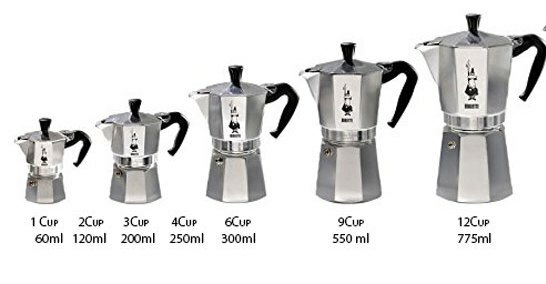 Typically, the father of Moka Pot Brewing. Bialletti is a classic one; this Moka Pot offers the traditional experience with updated safety measures and everything you really need. This Pot features an octagon shape, making it classy. It is made out of polished aluminum, making it quite beautiful to look at. Capacity for 3 cups. Stay-cool handles and knob. Very similar to the first one, this one features a more minimalist design. With the same aluminum finish, and the stay-cool handles and knob. This one has a 6 cup capacity and looks extremely traditional and classic. This one features perhaps the best old-school looks you will find in this list. 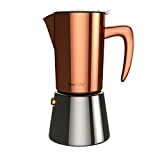 It’s made out of stainless steel but with a chrome or copper finish, this Moka Pot looks fantastic. With a 6 cup capacity, it is also quite big and overall this Moka pot is just gorgeous. The first one that features a modern look, and let me tell you, it rocks at doing that. This Bialetti is like the new-age cousin of the first one; made out of stainless steel and with a great ergonomic, heat-resistant handle, this one is another beautiful piece of art. It’s available in different capacities, from 2 cups all the way to 10 cups, making this a versatile contender. This one looks refined. It seems rather French and not Italian if you ask me, and the most classy pots you will find anywhere. Cuisinox brings this Stainless Steel Moka Pot, and it looks just fabulous on any kitchen. Has a capacity of 4 to 10 cups, depending on the version. The Handle is nice, but I instead have those always-cool handles. The First electric pot in the list. The best thing about electric moka pots is that the machine always measures the heat. You don’t have to worry about burning your coffee, and everything is made easy at the same time. Made out of stainless steel, along with plastic and such for the electric section, this is an excellent Moka Pot. And probably, the easiest to use of them all. It can make 3 or 6 cups, depending on what you need. Always-cool handle. And to finish the list, another electric contender, Bene Casa brings this slightly smaller Moka Pot. It makes 3 cups of coffee, and unlike the previous machine, it has an aluminum boiler. Also with a transparent container, so you can see how the coffee flows to the upper section. Cool-touch handle. We hope that the above content has given you good insights about Moka Pot brewing as well as some guidance about buying one. Though, we tried to cover most of the aspects, but still if you think there is something missing, do poke us via email and we will be happy to add that.